“A lakeshore property becomes the backdrop and the place to build family memories,” said Jim Eisler, manager of Edina Realty's Brainerd/Baxter office. The market for vacation homes tends to heat up when the weather turns nice. Edina Realty agents are expecting to be busy this weekend as city dwellers flock to the lake regions in northern Minnesota for fishing opener on May 14. Edina Realty is also holding an open house "extravaganza" that weekend when hundreds of homes will be held open. 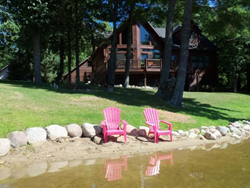 Edina Realty vacation home experts say the dream of owning a vacation property can easily become a reality, as the prices for lakeshore properties are now well within reach. Jim Eisler, manager of Edina Realty’s Brainerd/Baxter, Crosslake and Hackensack offices, says there’s a large selection of lakeshore homes for as little as $200,000 or less. While it’s a strong seller’s market in the Twin Cities, it’s a whole different ballgame in the vacation home market. “The vacation home market is a much more balanced market; we don’t have nearly the supply deficit and step-up buyer issues that the Twin Cities is facing,” Eisler said. Since a vacation home is a discretionary purchase, buyers historically have been choosy and often take longer to buy. But once they buy, that vacation home will often stay in the family for several generations, he said. There’s a good selection of vacation homes to choose from. On the Edina Realty website, which lists every active, available property in Minnesota and western Wisconsin, there are currently more than 8,800 waterfront properties for sale, ranging from a one-bedroom cabin on a small lake in Wisconsin listed at $45,000 to a $6 million seven-bedroom estate with 300 feet of lakeshore on Gull Lake. Eisler also noted that interest rates are favorable and said the lenders they’ve worked with have been very accommodating with jumbo loans and lakeshore financing. Nationwide, while vacation sales took a step back from the 2014 peak, they are still at the second highest level since 2006 (1.07 million). In 2015, there were an estimated 920,000 vacation-home sales, according to the 2016 Investment and Vacation Home Buyers Survey by the National Association of REALTORS® (NAR). Not surprisingly, waterfront homes tend to be more expensive than non-waterfront homes. For example, a 1,300 square foot home on Gull Lake will sell for well over $400,000, while the same size house would be half that price or less if it’s not on a popular lake. In short, lakeshore is still a good value proposition for buyers, but most buyers don’t buy as a financial investment; they buy this type of property as an investment for their family, Eisler said. The “Lakeshore” section on edinarealty.com enables consumers to search by lake name and view all active, available listings on a lake, river, creek, pond or channel as well as homes with just a water view. For more information on buying a waterfront property, the current housing market, or to contact an experienced Edina Realty REALTOR® for a free home value estimate, call Edina Realty Customer Care at 952-928-5563 or visit http://www.edinarealty.com.